Most of us use natural gas or propane every day to heat our water, cook a meal, warm the house, or grill a steak on the BBQ. But gas is highly combustible and can be highly dangerous when it leaks. Gas explosions are all too common in the news; the terrible devastation a natural gas explosion can cause to a home and a family is evident in the pictures and news footage we regularly see, but do you know what causes a gas explosion? A gas explosion occurs when the gas/air mixture reaches a critical value, then any spark, flame or heat source can ignite the mixture. The explosion is caused when the rapidly expanding, burning gas is confined and builds up pressure. As the pressure builds, something has to give, and in a home gas explosion it is usually the windows. Once the pressure finds a weak spot like windows, the pressure suddenly releases causing the bang of the explosion. 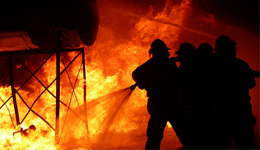 The most common cause of gas explosions are natural gas leaks through leaking hoses, defective control valves or gas connectors, or leaking propane tanks that can cause propane explosions. Our Phoenix personal injury law firm specializes in gas explosion cases nationwide; we seek financial compensation for clients who have been physically or psychologically injured due to the negligence of another. Unfortunately due to their ferocity, home gas explosions often lead to wrongful death cases; in those instances we represent the families who have suffered the death of a loved one due to the negligence of others. The explosion injury lawyers at Cunningham Law Firm in Phoenix have had a great deal of success handling gas explosion cases. In fact we obtained one of the largest product liability/ gas explosion verdicts in Arizona history when 2 brothers, aged 12 and 3, were severely burned following a natural gas leak from a defectively designed oven range. A jury awarded the boys and their family more than $43 million. Our case summaries highlight our experience of handling all types of gas explosion cases, including propane explosions and natural gas explosions. What’s more, we work on a contingency fee basis, which means that our clients don’t owe us a fee unless we obtain a recovery for them, so contact the gas explosion team at Cunningham Law today to arrange your free consultation. Statements on Cunninghamlawfirm.com is not meant as legal or medical advice. Consult with your health care provider for diagnosis or treatment.